Giant Tow Truck Woodworking Plan. Total Workshop search results: 34. 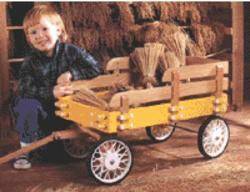 Displaying Page 2 of your woodworking search phrase CHILDRENS TRUCKS. This is a link to a Google 3D SketchUp drawing for an wooden toy old time dump truck. You will need the SketchUp software to download this drawing and its freely available online. We do not provide support for this software. Not all drawings have the measurements displayed but you can use the measurement tool in SketchUp to easily and accurately determine the dimensions of each lumber part. Most drawings do not have instructions, its assumed you can build it based on the completed drawing provided. Hi all. Here is an easy little toy you can whip up in an afternoon. This 10 inch pickup has a cartoon look with its over sized wheels and bright paint job. The wheels were turned on my lathe but you can buy pre made 2 1/4 inch wheels. This is a link to a Google 3D SketchUp drawing for a construction grade toy dump truck. You will need the SketchUp software to download this drawing and its freely available online. We do not provide support for this software. Not all drawings have the measurements displayed but you can use the measurement tool in SketchUp to easily and accurately determine the dimensions of each lumber part. Most drawings do not have instructions, its assumed you can build it based on the completed drawing provided. This is a link to a Google 3D SketchUp drawing for a wooden toy truck and bulldozer. This 3 piece toy will produce a lot of imaginative play from any child. You will need the SketchUp software to download this drawing and its freely available online. We do not provide support for this software. Not all drawings have the measurements displayed but you can use the measurement tool in SketchUp to easily and accurately determine the dimensions of each lumber part. Most drawings do not have instructions, its assumed you can build it based on the completed drawing provided. This is a link to a Google 3D SketchUp drawing for a wooden toy dump truck. You will need the SketchUp software to download this drawing and its freely available online. We do not provide support for this software. Not all drawings have the measurements displayed but you can use the measurement tool in SketchUp to easily and accurately determine the dimensions of each lumber part. Most drawings do not have instructions, its assumed you can build it based on the completed drawing provided. This is a link to a Google 3D SketchUp drawing for a wooden old time pickup truck. You will need the SketchUp software to download this drawing and its freely available online. We do not provide support for this software. Not all drawings have the measurements displayed but you can use the measurement tool in SketchUp to easily and accurately determine the dimensions of each lumber part. Most drawings do not have instructions, its assumed you can build it based on the completed drawing provided. Children will love you forever after you build this traditional playtime favorite. The removable stake sides give them extra carrying capacity for everything from dolls to dump trucks. To keep children and cargo safe, we added a stopblock to help prevent the front-axle assembly from turning too far and tipping the wagon. Children also need to be warned against steering this or any wagon down a hill. This is a link to a Google 3D SketchUp drawing for a wooden toy Jeep and cannon. You will need the SketchUp software to download this drawing and its freely available online. We do not provide support for this software. Not all drawings have the measurements displayed but you can use the measurement tool in SketchUp to easily and accurately determine the dimensions of each lumber part. Most drawings do not have instructions, its assumed you can build it based on the completed drawing provided. This is a link to a Google 3D SketchUp drawing for a childs dump truck. It has a crank to lift the dump and is a little on the large size at 26 inches long. You will need the SketchUp software to download this drawing and its freely available online. We do not provide support for this software. Not all drawings have the measurements displayed but you can use the measurement tool in SketchUp to easily and accurately determine the dimensions of each lumber part. Most drawings do not have instructions, its assumed you can build it based on the completed drawing provided. This is a link to a Google 3D SketchUp drawing for this toy fire truck which uses 1 3/4 inch wood wheels. You will need the SketchUp software to download this drawing and its freely available online. We do not provide support for this software. Not all drawings have the measurements displayed but you can use the measurement tool in SketchUp to easily and accurately determine the dimensions of each lumber part. Most drawings do not have instructions, its assumed you can build it based on the completed drawing provided.